August 27, 2013. According to Palestinian sources, only five tunnels were operational yesterday, used for the transfer of construction materials, fuel and wheat in limited quantities. Media reports cited that the presence of Egyptian military personnel in northern Sinai as well as the destruction of some tunnels and fuel reserve tanks led to a halt in tunnel activity from Friday through Sunday. August 25, 2013. As a result of heightened Egyptian military presence in northern Sinai, near the tunnels that cross between Egypt and Gaza, tunnel activity was halted on Friday and since then no goods have crossed to Gaza. Diesel fuel and gasoline were in short supply, in consequence, and long lines were reported at gas stations throughout the Strip. In addition, as construction materials also did not enter the Strip, prices have risen. Palestinian sources report that Egyptian military forces are actively destroying tunnels along the border. The Rafah Crossing was opened at 11am today. Passage is being permitted for medical patients with official referrals from the Palestinian Ministry of Health in Gaza, and foreign passport and residency holders. 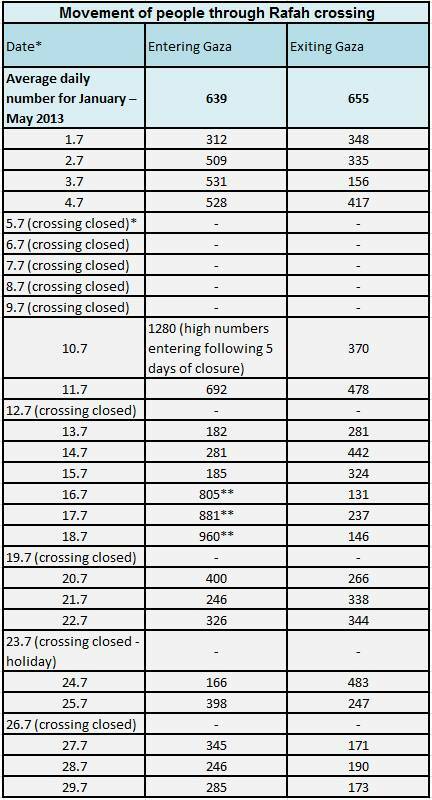 The crossing also operated yesterday according to these categories from 11am – 5pm, after it had been closed for five days. The waiting list of people trying to travel from Gaza to Egypt is being managed at the crossing itself and is only open to the categories listed above. Palestinian sources report that a medical committee has been established on the Egyptian side of the crossing to screen cases of medical patients wishing to cross in order to prioritize travel according to medical necessity. August 15, 2013. As a result of increased turmoil in Egypt, the Rafah crossing was closed today to traffic in both directions. Authorities in Gaza have stopped signing people up to travel. Individuals wishing to travel from Gaza via Rafah (medical patients with official referrals from the Ministry of Health, and foreign residents and citizens) had been asked to sign up on lists kept by Gaza authorities. When the crossing re-opens, priority will be given to medical patients in urgent condition and foreign citizens and residents whose travel documents are set to expire. August 14, 2013. Rafah crossing closed to those exiting ‎Gaza‬ in wake of events in ‪‎Egypt‬. August 7, 2013. Rafah Crossing, between Gaza and Egypt is operating under restricted conditions today. It will close tomorrow, for Eid al-Fitr, and re-open on Monday. During the month of July, 16,295 people travelled via Rafah; 6,281 traveled from Gaza to Egypt and 10,014 entered the Strip. On average, 203 people travelled via the crossing each day, compared to an average of 1,353 people traveling daily during the first six months of 2013. Some of the tunnels are still active and are being used to transfer construction materials, fuel and other goods including cigarettes and tobacco, fish, vehicles, sheep (livestock), sugar and flour to the Strip. Currently, an estimated 800-1,000 tons of cement are transferred through the tunnels daily, compared to 2,451 tons during the first six months of 2013. About 1,000 tons of gravel are transferred through the tunnels daily, compared to 8,324 tons in the previous six months; and a daily average of about 250 tons of steel are transferred, compared to 396 tons in the first six months of 2013. Over the last two days, about 280,000 liters of benzene have been brought in through the tunnels. 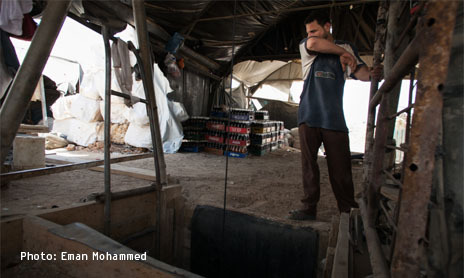 However, it is still in short supply in Gaza and as a result, Gaza residents have been buying more benzene from Israel. In July, about 2.5 million liters of benzene were transferred via Kerem Shalom for Gaza's private sector. In June, only 600,000 liters of benzene entered via this crossing. 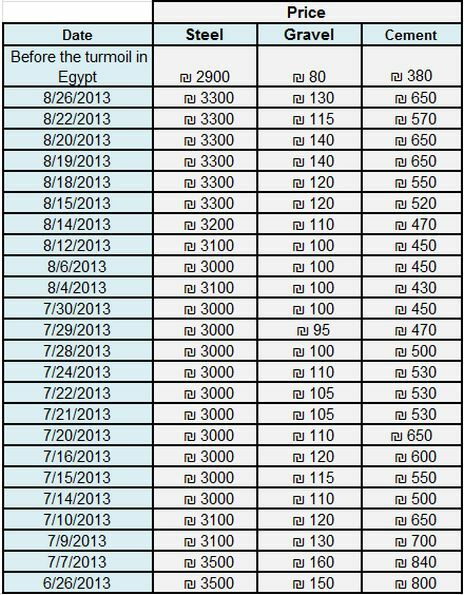 During the first five months of 2013, no benzene at all was transferred via Kerem Shalom for Gaza's private sector. August 1, 2013. Rafah Crossing continues to operate under restricted conditions, while tunnel activity has slightly increased. It is estimated that between 30-40 tunnels are currently operational. The tunnels are mainly being operated at night, due to Ramadan. For the second time since the current crisis began, vehicles and spare parts were transferred via the tunnels. There is still a shortage of benzene in the Strip, though small quantities continue to enter. It’s estimated that approximately 150,000 liters of benzene and 900,000 liters of diesel enter per day. The price of construction materials, which initially rose as a result of decreased tunnel activity, has continued to fall. July 30, 2013. Rafah Crossing continues to operate under the same restricted conditions, though various reports indicate that exceptions are being made to the categories previously announced. For example, some individuals with visas to third countries and plane tickets in hand are being allowed to transit directly to the Cairo airport. It is unclear how many people meeting this condition have been able to cross. There is also information indicating that individuals meeting this condition as well as those falling into the categories previously announced – foreign passport and residency holders and individuals in possession of an official medical referral from the Palestinian Ministry of Health – have been prevented from crossing. The crossing was closed on Tuesday due to an Egyptian national holiday and again on Friday. On July 5, as a result of the situation in Egypt, the Rafah crossing was closed. It re-opened five days later, on July 10, under restricted conditions. The closing of Rafah Crossing has blocked Gaza residents' access abroad and has left them with almost no way of exiting the Strip. In view of the fact that Israel does not allow access to or from Gaza via sea and air and imposes extensive restrictions on travel through Erez Crossing, Gaza residents rely on Rafah Crossing for travel abroad. The closure of the crossing during the days July 5-10 thwarted the travel plans of more than 10,000 people inside the Gaza Strip, including medical patients, and many Palestinians were stranded on the Egyptian side of the crossing, in Saudi Arabia and in other countries, unable to return home. Between July 20-28, 8,203 tons of gravel and 150 tons of cement entered Gaza via Rafah Crossing for projects funded by the Qatari government. On the 10th and 11th, 200 tons of gravel also entered. For reference, during the first half of the year, the average amount of gravel which entered via Rafah per month was 21,811 tons. Despite ongoing instability and military action in Sinai, tunnel activity has stabilized since last Wednesday and the prices of constriction materials have gone down slightly as reflection of this. Diesel is entering in sufficient quantities to supply the daily amount needed to operate the Gaza power plant at its current capacity, though shortages in benzene are still being felt. All other types of goods are available on the local market. It’s estimated that approximately 30% of the tunnels that were active in the period preceding this month are currently active. Over the course of July, there was an increase in incoming goods via Kerem Shalom of approximately 10 truckloads per day, not including fuel (or 20 truckloads per day including fuel), in an apparent response to the slowdown of the tunnel trade. As mentioned previously, during the month of July, benzene has entered in large quantities for the private sector, totaling, as of July 28, 2,306,222 liters. It is estimated that Gaza needs about 6-7.5 million liters of benzene per month.